Making a biscuit quilt or puff coverlet is one of the easiest craft quilting projects, requiring only simple sewing and the ability to sew a reasonably straight seam. 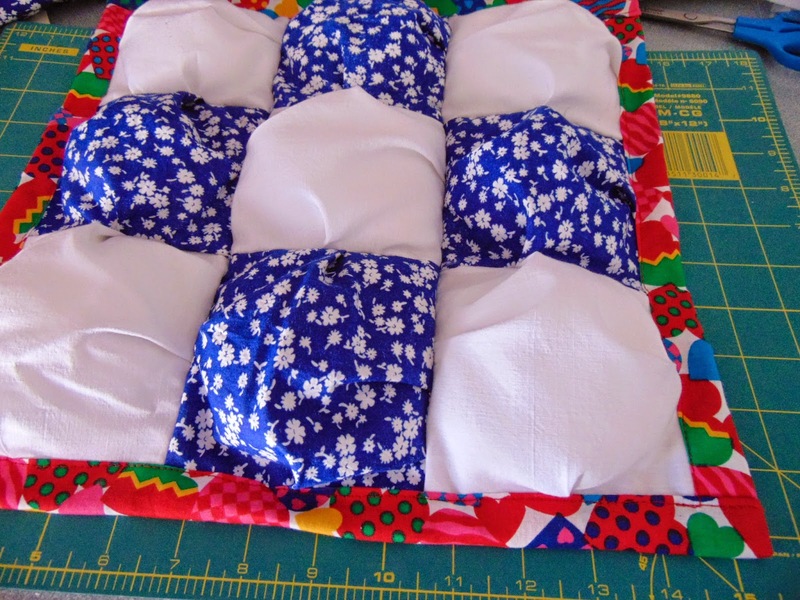 Use leftover fabrics, randomly placed, or create a design with the squares. The general concept of the puff quilt is that two squares are sewn together, one larger than the other one, and the sewn squares are joined together to form a coverlet. You can choose any size you want for the squares and for the quilt, and squares aren’t required. I’ve seen a Simplicity pattern that uses 7 1/2 by 9 inch rectangles to make a reversible puff coverlet, but you have to watch the direction of the rectangles. I prefer top squares that are about 6 inches to start, with the bottom square 5 inches. This makes completed squares about 4 inches. I also prefer light colors for the bottom squares, although they don’t show if you use a backing fabric for the quilt. Lighter colors on the bottom will let you choose a light color for the backing fabric; otherwise, you’ll have to use a dark color or a heavy fabric to prevent the backs of the squares from showing through. Wash and dry all the fabrics before you start. Iron if necessary. Cut as many 6-inch top squares as you want to try your luck with, and an equal number of 5-inch squares. Once you’ve tried this, you may want to try even smaller squares. Make your top square an inch larger than the bottom square unless you’re making top squares less than 4 inches. With a 4-inch (or less) top square, use 1/2 inch smaller squares for the bottom. A 4-inch top square matches best with a 3-1/2 inch bottom square. Match each 6-inch square with 5-inch square, right sides together and wrong sides showing. 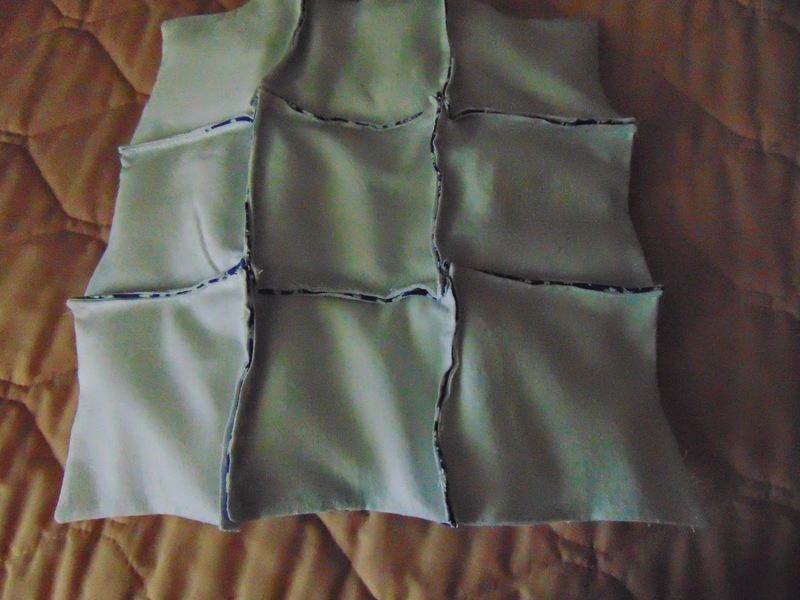 Line up the top left corner, then pin all corners to make the stitching easier. Make a pleat in the center on three sides. If you have a zipper foot with your sewing machine, it works well for all of the stitching in this quilt. Use about 1/8-inch seam allowance. Starting about an inch from the corner, stitch around the three sides and an inch into the fourth side, leaving an opening for turning the square. Press around the edges of the squares once they’re turned. Make as many as you need for your project. 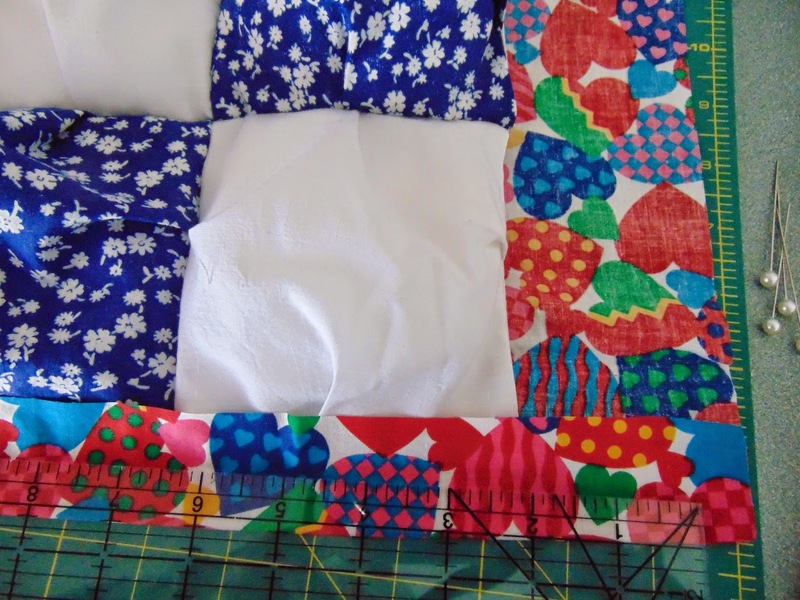 Design your quilt by laying the squares on a flat surface with open edges at the top and moving them around until you like the combinations and the size. 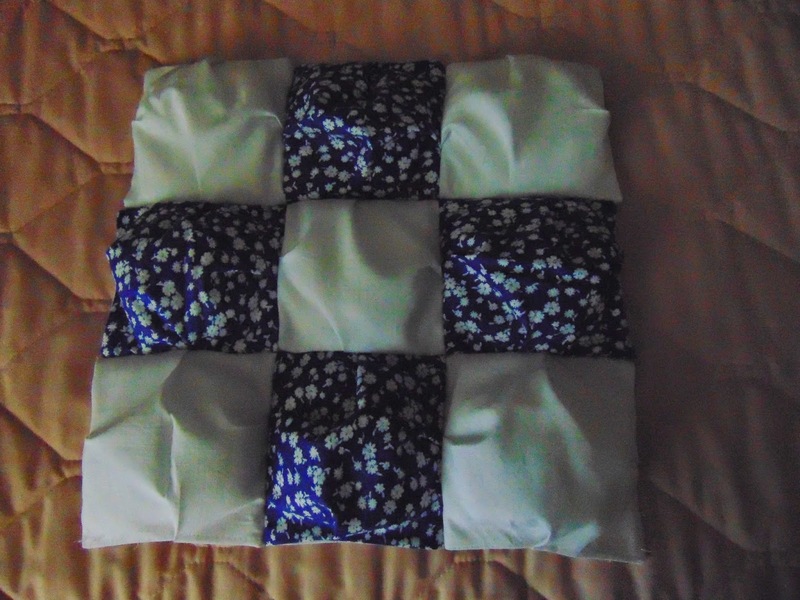 You can make a baby quilt with 7 squares by 9 squares in the 6-inch size, or 63 squares, but you can make a large pillow with 16 squares (4 by 4) or a 12 inch pillow with 9 squares. Starting with the left square of the top row in your layout, take the first two squares and match the edges with the fronts together. Stitch together with a 1/8 to 1/4 inch seam. Sew each square to the next one until you have a row of stitched squares. Do the same for the other horizontal rows. You may see patterns calling for stitching biscuits so they are overlapped. I tried that and it works, but not as well as stitching them with front sides together. It's more difficult to keep them straight, and it's easy to miss the back edge. Cut pieces of batting of your choice about an inch smaller than your back squares. You’ll probably want two pieces for each square. Don’t make it too thick or it will be difficult to sew between the squares. I used Mountain Mist batting for the sample here and it has 4 thin layers together that worked well for my project. Starting with the top row, stuff each square with an equal amount of batting and pin it closed with a vertical pin. 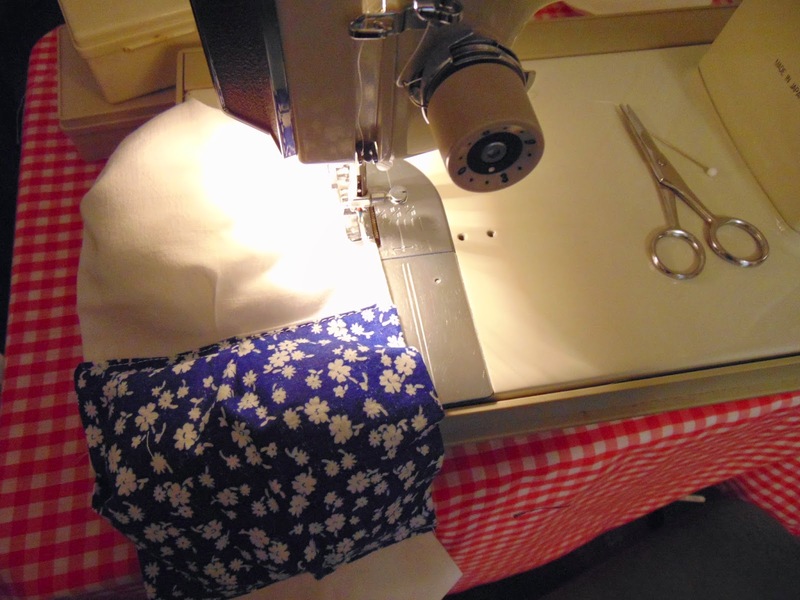 Once you have the batting in place, stitch along the open edge, removing pins as you stitch. Here’s where a zipper foot really works, since the batting makes the quilt bulky. Complete each row of squares. Stitch each row of squares to the next one from the backside with front sides together until you have one solid piece for the quilt. Cut a backing piece from a complementary fabric, adding 6 inches all around. Add an extra inch for each seam you have to make in the backing. Center the quilt onto the backing fabric and pin into place. You should have 3 inches of backing all the way around that extends beyond the quilt. Press the edges toward the quilt, so they’re doubled, and extending about 1 1/2 inches all around. Fold that edge again catching the edge of the quilt, and pin with straight pins. Shape the corners so they look alike, either with a straight seam or by folding a triangle at the top to create a mitered look. Machine stitch all the way around the quilt with a straight stitch, just catching the edge of both the backing and the quilt. Remove the pins. You can add knots to the quilt by hand if you choose to hold the back to the front, but it isn’t necessary to keep the batting in place. The biscuit square confines the batting, so it won’t move much with washing. 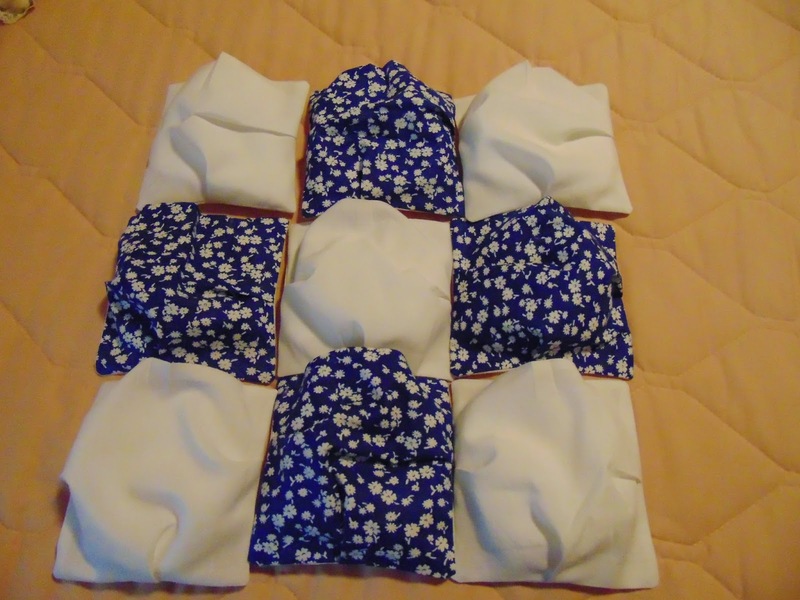 My sample would be good for a pillow, but I'll probably give it to my granddaughter for a doll quilt. She'll put it to the best use. Redwork and blackwork embroidery are a form of cross stitch using evenweave or Aida cloth with embroidery thread. If you’re a counted-thread cross-stitcher, you’ll pick this up quickly and probably enjoy trying thread colors other than black or red. You can make your own pattern using a scroll saw pattern book, a child’s coloring book or a picture you like. It’s best to keep it simple to start because the embroidery is fancy, and you only need the outline. Here’s how to make the butterfly design. You’ll need to make some decisions along the way -- fabric type, thread colors and stitches to use. 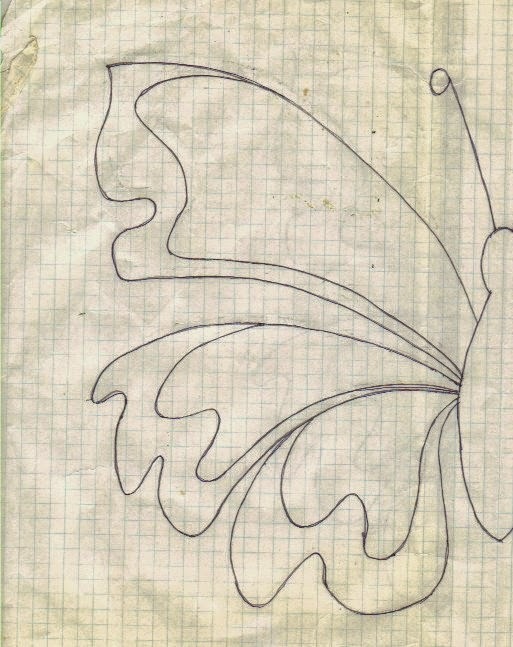 Make a pattern on grid paper that is one-half of the butterfly design and fold it to trace the opposite side by holding it up to a window. Use tracing paper to transfer the completed outline of the design to 11-count evenweave fabric or a fabric of your choice. Eleven-count evenweave has eleven blocks or stitches to an inch. Fourteen-count works just as well because the size of your drawing determines the size of the design, unlike counted cross-stitch where the design size is smaller with 14-count fabric. 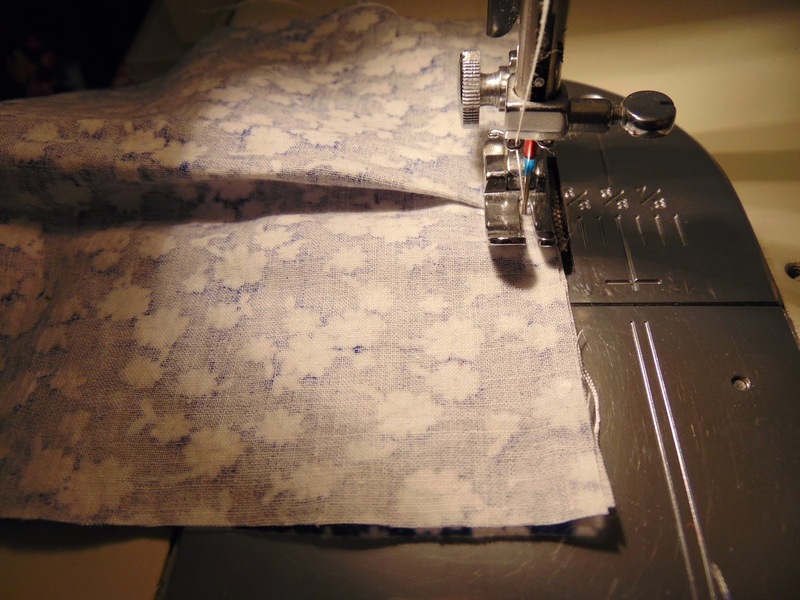 You can also use 22-count and work over two squares to get the same result with a finer fabric. Choose your color or colors. You’ll notice the example here is in blue and brown, and there are blues and browns in the outline. Decide how thick you want the stitching. Embroidery floss comes in six strands, and you can separate the threads in one, two or three strands. Fine work uses only one strand of thread, but you may want the outline stitching to be heavier, using two or three strands in the needle. You may also choose to outline with a sharp-pointed needle instead of a tapestry needle. You'll need a dull point needle for the fill stitches. 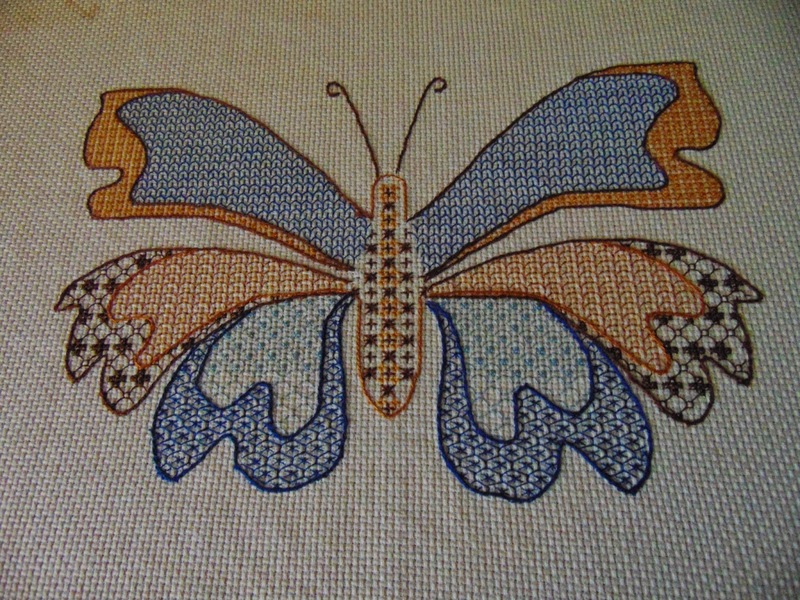 Outline the design in a backstitch or double running stitch. 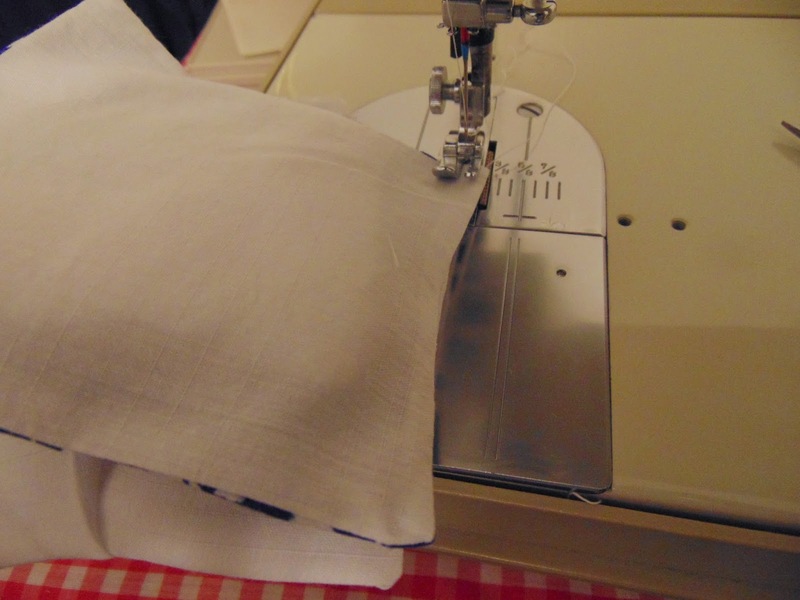 Double running stitch requires two passes through the outline path. 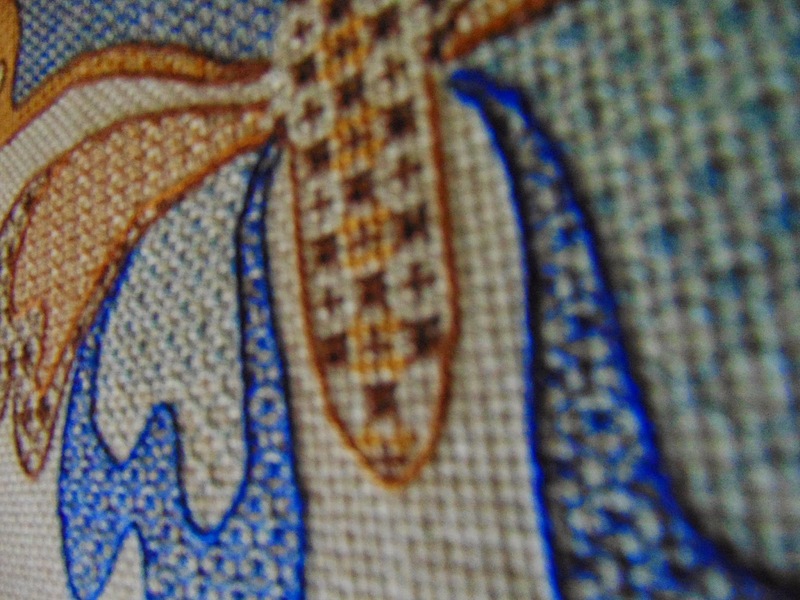 Backstitch only requires one pass through the outline, but each stitch is forward and back. You may decide not to outline an area you don’t want defined. Notice we didn’t outline where the wings attach to the thorax of the butterfly in the example. We also completed the antennae at this time, since we were backstitching with the dark brown thread. Select stitches you’d like to try. 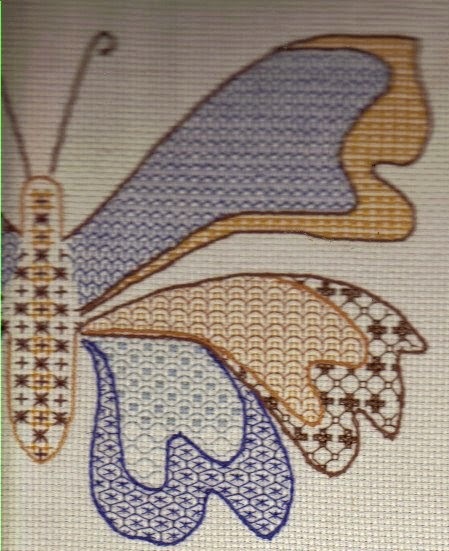 These embroidery stitches are repeating designs, but you can design your own or use pictures for ideas. Notice we didn't fill in all of the light blue design at the bottom of the wings. 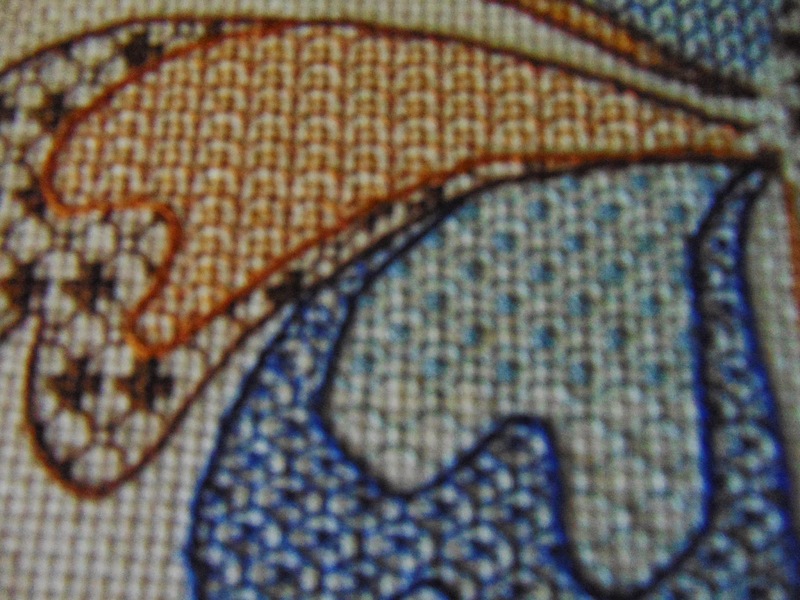 Fill in the backstitched areas so that each side is the same or at least similar. If you choose a subject from nature (like the butterfly), it doesn’t have to be exactly the same on each side, but needs to be similar. Create your own style. Notice that the lower wing design in the example isn’t complete to show shading in the bottom inner lobes. The inner wings are designs like scales on a fish, while the exterior wings are “x” patterns. The top wings are both blue and brown, while the second set of wings is brown and the bottom wings are shades of blue. The thorax or body of the butterfly is knobby and uses all the shades of brown. You'll miss some of the style with creating your design in all red or black, but the overall impact of a solid color is what gives redwork and blackwork its name. Enjoy needlework crafts while the weather keeps you inside. See ya soon!